We landed in Sydney Australia on January 3rd, 2010 for a five day stay. Sydney is Australia’s largest city with a population of approximately 5.5 million people. Sydney reminded us very much of Vancouver. Both Vancouver and Sydney each have a well known bridge which is a symbol of the city – Vancouver’s being the Lion’s Gate Bridge and Sydney’s is the Harbour Bridge. They are both port cities, have a vibrant down town core, many trendy areas, a moderately good public transportation system, and lots of urban sprawl. Our general impression of Sydney was that it was an expensive city to visit if you elected to partake in the well advertised tourist tours. For example, a tour boat of the harbour with dinner provided on the boat cost around $125/person. We elected to take the public transit ferry ships to various points in and around the harbour. You could buy a “day tripper” which provided for unlimited public transport travel for $17/person. It seemed strange to see the “tourist boats” traveling along side the public transit ferries each going to the same places. We found that Internet Access in the hotels can be a bit of a rip off. Apparently Australia is in the middle of the internet spectrum. Some hotels provide it complimentary as part of your stay in the hotel. Others charge a daily fee. Our hotel charged as hourly fee of $12.00 and a daily fee of $27.00. It was obvious that the hotel was catering to the business man, whose Company would pick up the Internet tab. Given the recent turn around in the economy, I suspect that many Companies would be looking at reducing costs wherever possible and will likely instruct their employees to seek accommodation elsewhere where Internet is free. On the other hand the hotel is trying to make a quick buck wherever possible….so who knows? We found an Internet Café two blocks from our hotel that charged a fee of $2.00/hour for Internet Service. Needless to say we found the idea of the hotel charging $12/hour a little bit of gouge. So if you are travelling in and around Australia, one of the questions to ask the hotels you are booking with is whether they provide free Internet Access. 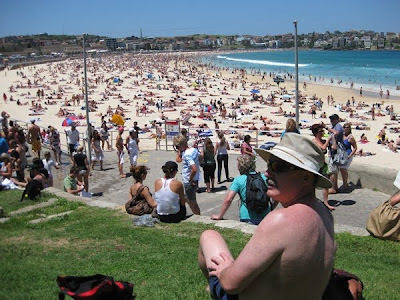 Bondi Beach was “IMPRESSIVE”. The water was a beautiful aqua blue. The garbage-free pristine sandy beach was dotted from one end to the other with a “bazillion” people lazing in the HOT sun on a Tuesday afternoon. Now we know why Bondi Beach is recognized as being world famous. We could and cannot get over how intense the sun is in Australia. Likely it is a result of two factors: (i) the degrees latitude is much closer to the Equator. Sydney is 34oS while Edmonton is 53oN and (ii) it may be the fact that the ozone hole over Antarctica is having an influence. We were on the beach for less than an hour and we were as red as lobsters. You could easily tell where we forgot to apply the sunscreen. The Blue Mountains are a two hour train ride from Sydney. It is a world heritage site similar to Banff and Jasper. On the way to the mountains, one travels through a metropolitan jungle traveling through one urban area to another (similar to travelling east from Vancouver to Hope), and then suddenly the Blue Mountains come upon you as there is an ear-popping rather steep elevation change to a topographic escarpment– like landscape. The Blue Mountains are more like the Appalachians as they are well weathered, not jagged like the Rockies. The Blue Mountains get their name because the area is densely covered with oil bearing Eucalyptus trees. Finely dispersed droplets of oil from the trees in combination with dust particles and high humidity/water vapour in the air give the atmosphere a hazy smoky blue appearance. I image that our closest analogy to a similar spectacle would be the Smoky Mountains in Kentucky. We were not that fortunate in getting any breath-taking vistas while at the Blue Mountains. The area was socked in with low lying clouds so it was foggy with poor visibility. Maybe on our return trip to Canada (we fly out of Sydney on Boxing Day) we will have the opportunity to go back and visit the Blue Mountains. We are off to Adelaide and the final leg of our journey to Kadina.